The SharedSolar team is busy on all fronts, and the hardware build team is no exception. We’re excited to get a significant number of devices into the field so we can provide more people with electricity and prove our concept. To that end, we’ve recently made a large purchase of equipment in order to build a total of 24 prototype systems, and Levi and Harrison are both new to the project and will help with the build. Each prototype system is comprised of two large enclosures for metering and one small enclosure for processing and controlling. These enclosures contain power meters, network switches, a small plug computer, a modem, and lots of wiring, so as you can imagine our lab is quite full of stuff. The amount of equipment and tight deadlines to which we are working requires a level of organization to which some graduate students may not be accustomed. 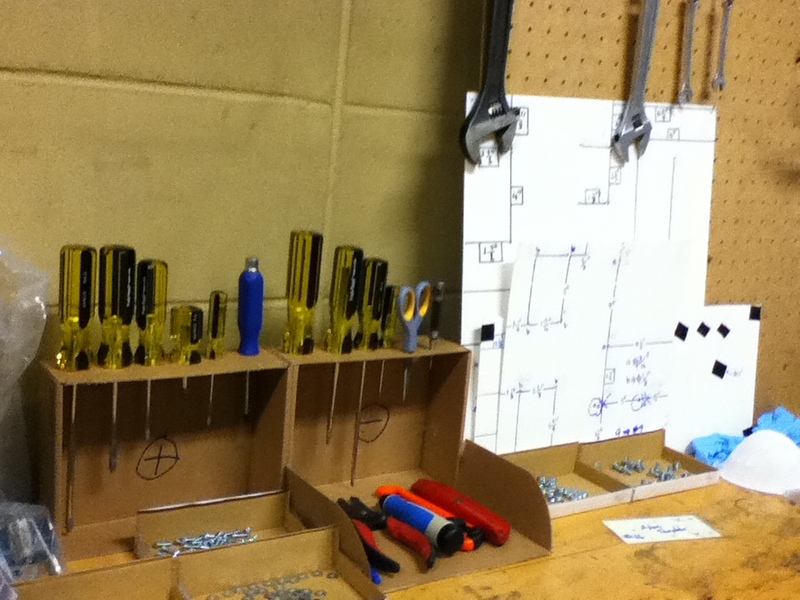 We’ve implemented a manufacturing process adopted from the lean manufacturing world. The most important part in our process is the router document. This document lists top-level, step-by-step directions to completing an enclosure. In order to build a system, a router is printed for every enclosure involved. 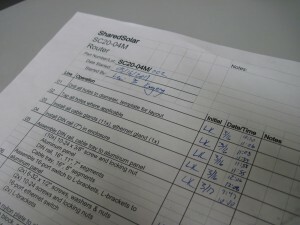 As a step is completed, the operator signs his or her initials and the date and time at which the step was completed. This router serves two major functions: one, to give the operator a list of instructions and two, to lend accountability and traceability to the build process. At the end of each day, each of us can take the routers weâ€™ve worked on and upload to a shared document the latest step completed and the date and time at which it was completed. This will eventually allow us to see how much time it takes to build each system (hopefully over time this number will improve) and predict the completion dates. 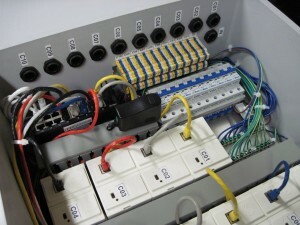 A manufacturing router for metering enclosure. Another component of the process is what weâ€™re calling a â€œconstruction document.â€ In industry, this type of information would be captured in a detailed engineering drawing, assembly drawing, or manufacturing drawing. Since weâ€™re in the business of assembling off-the-shelf components into an enclosure and not building the components themselves, we thought the best way to capture the necessary technical information would be in a document. The construction document contains standard wire lengths, more detailed instructions, and photographs of the building process. For these first couple systems, the routers have been beneficial in reminding us of the sequence of steps during the process. We hope that further into the big build, they will be more valuable in tracking time-to-build and estimating ship dates. Here’s the first mass-produced metering enclosure! Our first mass-produced metering enclosure. We have been receiving data from the pilot site for a few months now and are able to look at the consumption patterns of our customers. 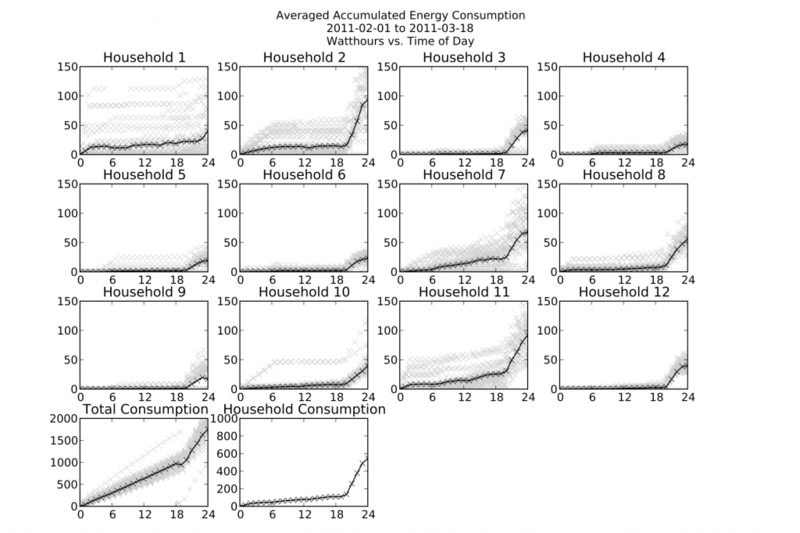 The plot shown is the accumulated energy consumption for that day. The black line is a binned average for each hour. The slope of the black line is the average power. This shows that our customers primarily use electricity during the evening hours, which presents a challenge for a solar system and necessitates a battery system. The low consumption customers (< 50W) only own lightbulbs while other customers have entertainment appliances such as televisions or radios. Many are also using cellphone chargers. As designs and processes are finalized, all the needed tools are getting a fancy home. And we all know that productivity is directly proportional to organization. Those fiberglass/plastic enclosures and aluminum plates are no match for these bad boys. 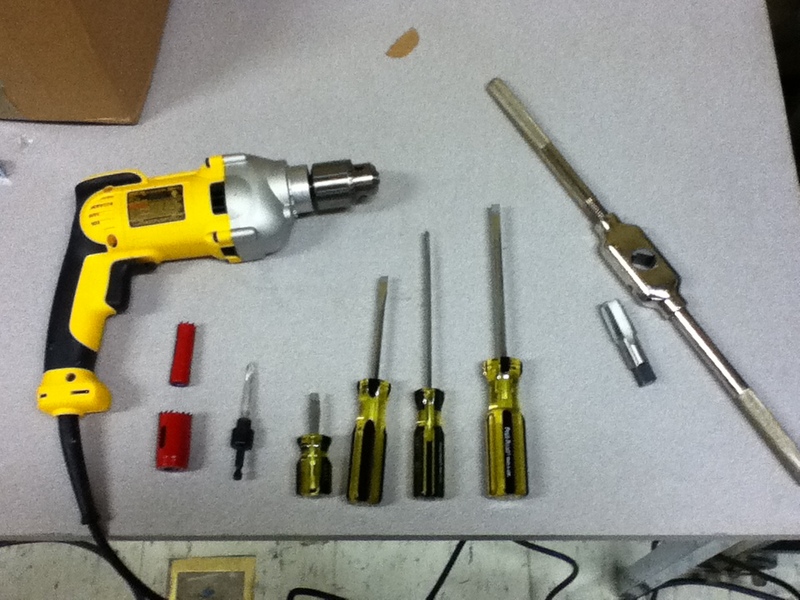 . .
Power drill, hole saws, screw drivers, tap w/ handle. Game over. Here is a really quick video tour of the assembly lab. As you can see, we just got a shipment of enclosures and other goodies, hence the stacks of boxes. Yes it’s full. Yes it’s a little messy now. Yes Justin is trying to smile even though it’s late and we’re both still here. But this is where the magic will happen, soon enough. Stay tuned for more (admittedly low quality) video updates from the assembly lab.